Experience and data show that shutting off electricity can reduce loss of life and property when weather conditions create high fire hazards. But despite warnings of extreme fire hazards in early October 2017, PG&E failed to cut power. Dr. Craig Clements and his research partner, graduate student Carrie Bowers, are zeroing in on one of the main culprits behind 250 fires that stretched across six California counties in October 2017. “It’s a critical weather pattern,” said Clements, a meteorologist at San Jose State University who specializes in wildfire behavior. In a recently completed research study, Bowers and Clements detail the speed, location and time of a weather event known as the “Diablo Winds.” Those are dry, northeast winds that develop great speeds as they descend from high elevations in the Sierra range, turning into windstorms that fan out across the Central Valley and Northern California. “These downslope windstorms have very strong surface winds, so it’s a dangerous situation when there’s an ignition,” Clements said. Their research paper shows that Diablo Winds happen most often in October, at the time ground fuels are driest. The combination sets the stage for extreme fire. The 50-plus-mph winds can topple electrical poles and power lines, which can ignite dry brush on the ground. Investigators from Cal Fire concluded that 12 of the blazes in last October’s North Bay fires were caused by PG&E’s electrical lines or other equipment. Coffey Park in Santa Rosa was destroyed by the Tubbs fire. This computer simulation, created by researchers Clements and Bowers, shows the wind speeds peaking in the evening hours on Oct. 8, 2017, the night of the fire. One way to combat the devastating effects of the windstorms – and potential fires – is to shut off power before the lines get blown down. “I think it’s a great way to mitigate the risk of catastrophic wildfire,” Clements said. The windstorms can be predicted and tracked up to two days before they reach vulnerable areas. Power companies can monitor them and cut power as needed. But despite ample warning of extreme fire hazards in the fall of 2017, PG&E did not preventively cut power in the North Bay. The company said it cannot ignore the significant change in how wildfires are affecting California as they impact more people than ever before. PG&E also said it “didn’t wait for its regulator, lawmakers or others to mandate changes” and that the company “took action immediately, launching an aggressive wildfire prevention and preparation program” called the Community Wildfire Safety Program. PG&E also said, “In light of the changing environment and last year’s wildfires, we believe that proactively turning off electric power for safety – as a last resort during extreme fire danger conditions – is an important precautionary safety measure to further reduce the threat of wildfire and protect public safety.” See PG&E's complete statement here. Cutting power has been routine at San Diego Gas & Electric for five years. The utility has de-energized power to homes and businesses during 19 weather events since 2013, including the firestorms that swept across Southern California in December. Using its extensive monitoring network, the San Diego utility is able to minimize the power shutoff – sometimes cutting power to a small number of customers. SDG&E has 175 weather stations in the field. Meteorologists monitor dangerous weather conditions up to 10 days in advance. They use satellite data to gauge how dry the grasses are. Crews are sent into trouble spots to see how much dry fuel exists. Even dry pine needles are taken into account. In 2017, as moisture hit record lows, Santa Ana winds of up to 90 mph were forecast. Brian D’Agostino, the Fire Science Director for San Diego Gas & Electric knew it was time to hit the kill switch. Twenty-four hours before cutting power, a dialing system notified customers. “We were confident with all the information we had that any ignitions in the backcountry of San Diego posed an immediate threat to life and property, so the decision was made at that point that the safest thing to do was to de-energize,” D’Agostino said. 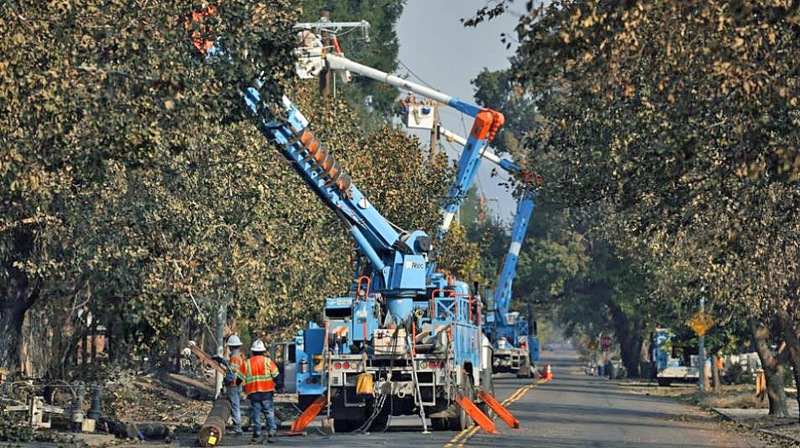 PG&E told NBC Bay Area that the company is now considering cutting power when conditions warrant it and that it’s learning how to do it from San Diego Gas & Electric. The California Public Utilities Commission agrees that cutting power can prevent wildfires and save lives and property. The CPUC announced new de-energization guidelines in July. Among the requirements, utilities must meet with communities that will be impacted and notify customers, if possible, that their power will be shut off.